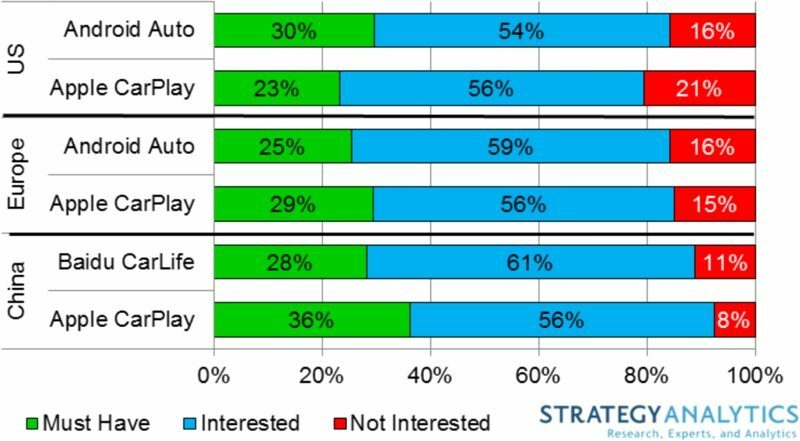 CarPlay is becoming an increasingly important feature that consumers look for when purchasing a vehicle, according to a new report released today by Strategy Analytics. In a survey querying future car buyers about their interest in Android Auto, CarPlay, and Baidu CarLife in the United States, Western Europe, and China, Strategy Analytics discovered the majority of consumers are interested in CarPlay. In the United States, 23 percent of respondents said CarPlay was a "must have" feature, while 56 percent said they were "interested." Just 21 percent were "not interested." In Europe and China, the numbers were even higher. 36 percent of respondents said CarPlay was a must have feature in China, and 29 percent said the same in Europe. 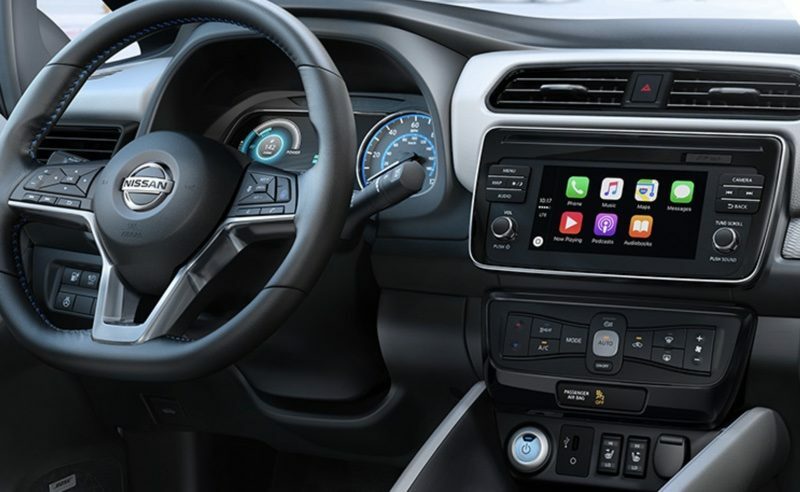 "All of our research suggests that consumers will soon be ready to adopt CarPlay and Android Auto for their infotainment needs, which is another round of bad news for embedded navigation suppliers and OEMs that want to sell upgraded navigation systems." Continued Viita, "It also shows a missed opportunity: OEMs have been including these systems 'as standard,' when our research suggests that consumers would actually be willing to pay for them, even to the price of traditional navigation options." For the survey, Strategy Analytics queried 1,503 consumers in the United States, 1,607 in Western Europe, and 2,003 in China. To participate, respondents were asked to confirm whether they owned or leased a motor vehicle and a smartphone, and they were only asked about in-car mirroring systems available in their regions and compatible with their smartphones. Though CarPlay has been available since 2015, car manufacturers didn't begin widely adopting the feature until mid-2016. CarPlay is now included in many new 2016 and 2017 vehicles from a wide range of car makers like Ford, Cadillac, Honda, Kia, Audi, BMW, Mercedes-Benz, Volkswagen, Fiat-Chrysler, and more. More than 200 vehicles include CarPlay support, with Apple offering an official master list of all the CarPlay vehicles available in the United States on its website. CarPlay is also available in many aftermarket infotainment units from companies like Pioneer and Alpine. I’ve had it in my new car since Feb....it’s great! Would not get a car without it. Count me as another Toyota / Lexus fan that is seriously interested in CarPlay. It MIGHT be enough to make me jump ship as someone that has owned at least 5 Toyotas and 6 Lexus vehicles. Too bad it doesn't let you use Google Maps or something else. Maps is beyond useless and often dangerously inaccurate. It's also useless without a signal, which is the majority of the places I drive. I use my built in, but often outdated built in GPS system which can at least use my iPhone to search Google and import the location. Why do car companies think they can do user facing software? They are usually about as talented at software as the companies that make set top boxes for Comcast. For me it’s a must have but I’m really worry about how slow the development of CarPlay has been in the last couple of years... it is still very immature and it needs third party apps integration ASAP!! It has third party app integration. More developers need to develop for it. Oh sure, give the automakers permission to arbitrarily charge $2500 extra for something they damn well should be including. Also, CarPlay is quite sluggish and unremarkable on the three cars I’ve seen it on, using an iPhone 7. I e only seen it on a Chevy Volt (2016? Model). I thought it was quite speedy. My bigger question is why we don’t just get a driving interface on iPhone, particularly the plus models. How easy would it be to slap your phone in a dock sideways and call it a day? With nfc, wireless charging, etc it could be pretty damn seamless. Just dock and go. This makes more sense to me than a second mini computer in every vehicle. Granted this screen serves as vehicle information too. So it’s not just CarPlay and android auto (I think that’s what android calls it). Anyway none of these things are a huge draw to me. If the car I’m looking at happens to have it, great. We just bought an suv without CarPlay and don’t regret the decision at all. I cannot say that I am willing to pay a lot of extra money for CarPlay. But I am completely unwilling to consider any car that does not include it. Currently my wife is car shopping and she likes the CarPlay in my truck well enough to result in several cars she has always been interested in (such as a Subaru Forrester) being eliminated as contenders due to the lack of CarPlay. I have also used Android Auto and if I used Android as my daily driver phone I would feel the same way about Android Auto. The car makers infotainment years are over. Why would I want one Navigation system in my hand and a different one in my car? And why would I want one music library/app in my hand (and therefore my home) and a different one in my car?